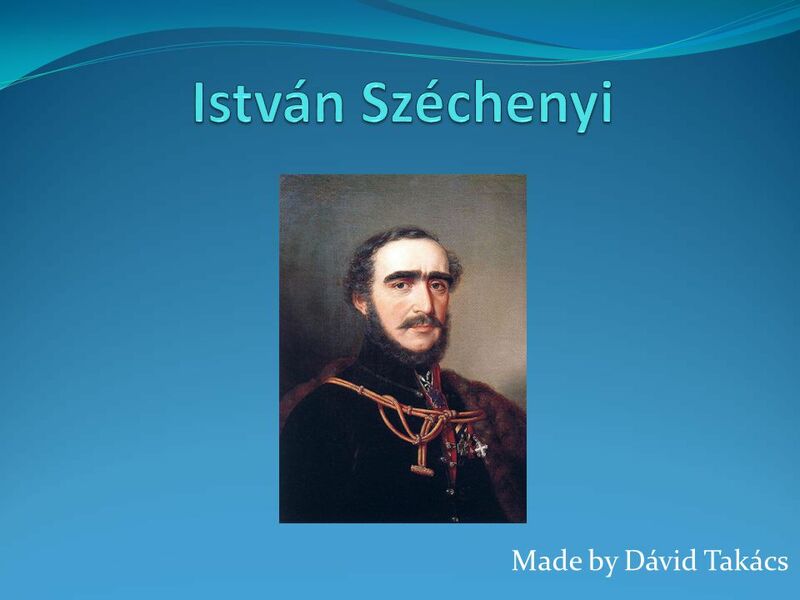 2 István Széchenyi Count István Széchenyi de Sárvár-Felsővidék (21 September 1791 – 8 April 1860) was a Hungarian politician, writer, one of the greatest statesmen of Hungarian history. 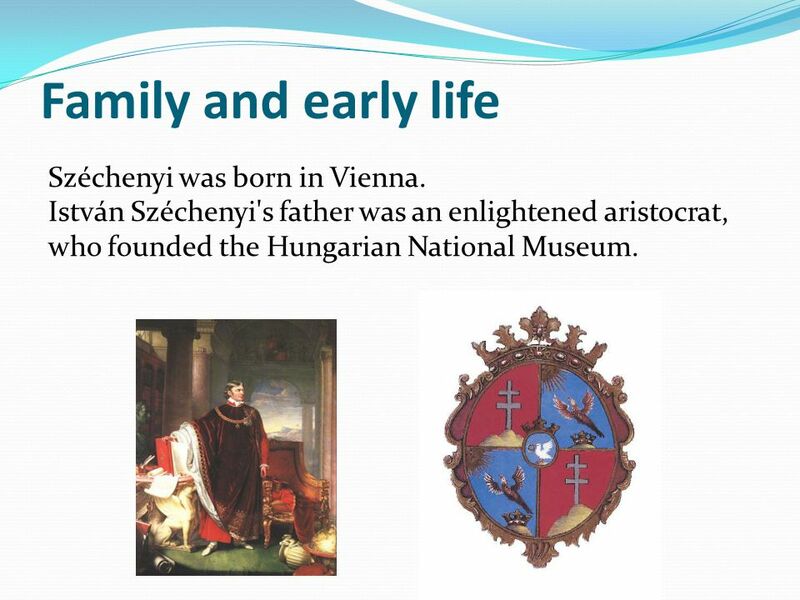 3 Family and early life Széchenyi was born in Vienna. 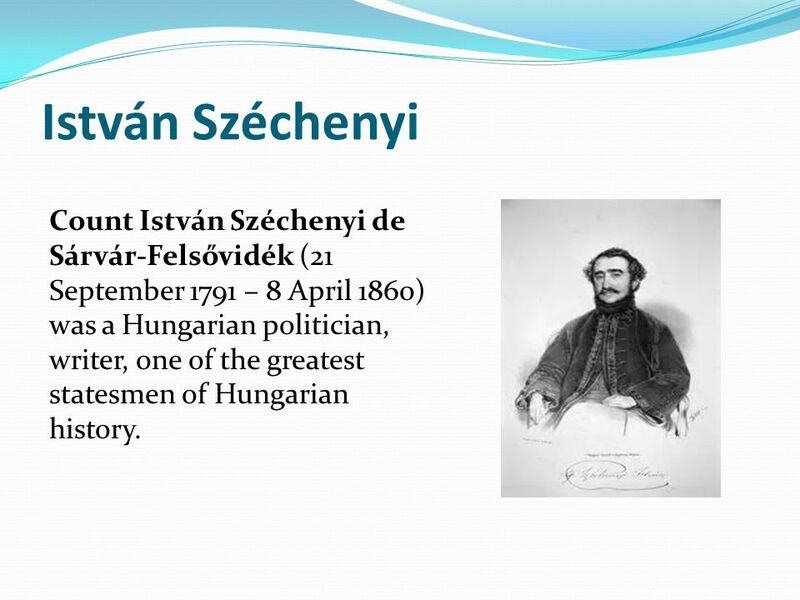 István Széchenyi's father was an enlightened aristocrat, who founded the Hungarian National Museum. 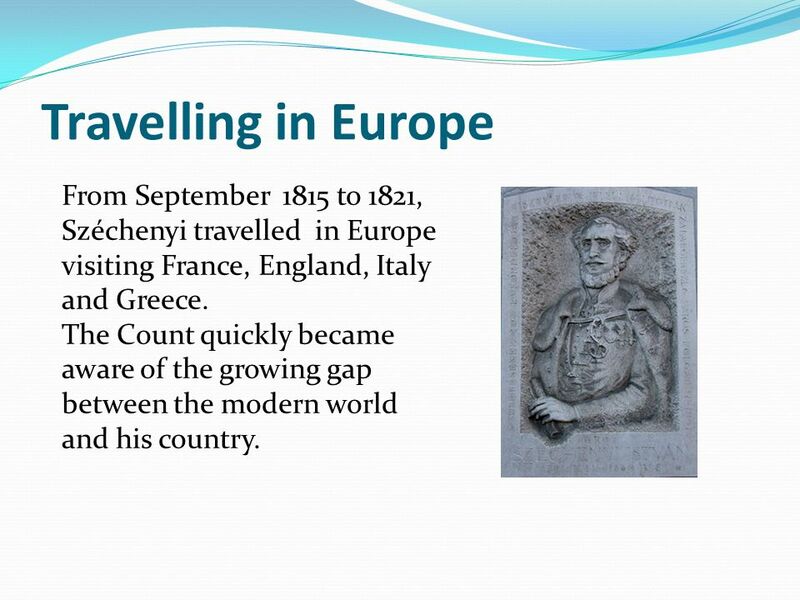 4 Travelling in Europe From September 1815 to 1821, Széchenyi travelled in Europe visiting France, England, Italy and Greece. The Count quickly became aware of the growing gap between the modern world and his country. 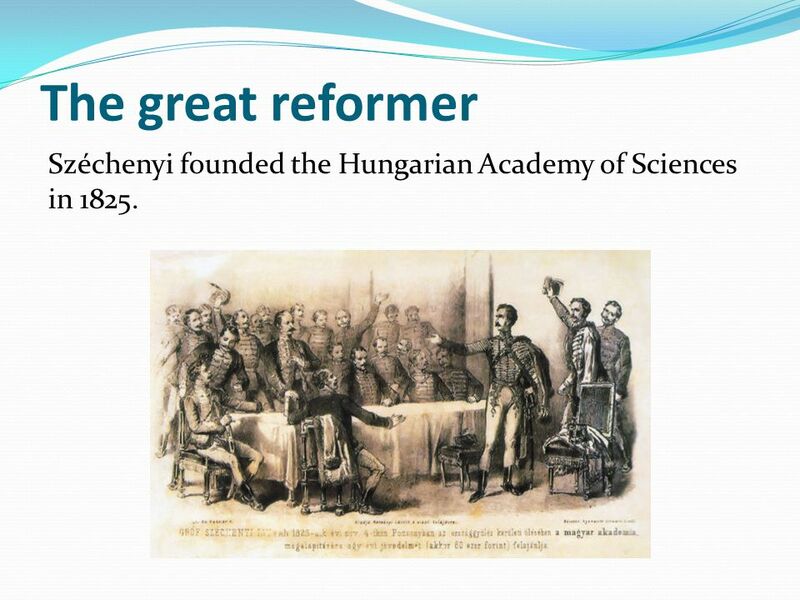 5 The great reformer Széchenyi founded the Hungarian Academy of Sciences in 1825. 7 Marriage and family In 1836 at the age of 45, Széchenyi married Countess Crescence Seilern in Buda. 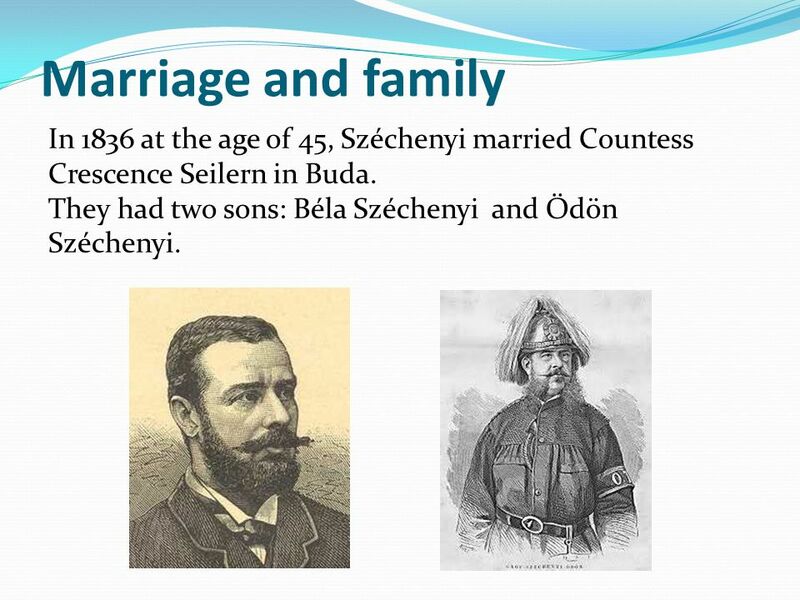 They had two sons: Béla Széchenyi and Ödön Széchenyi. 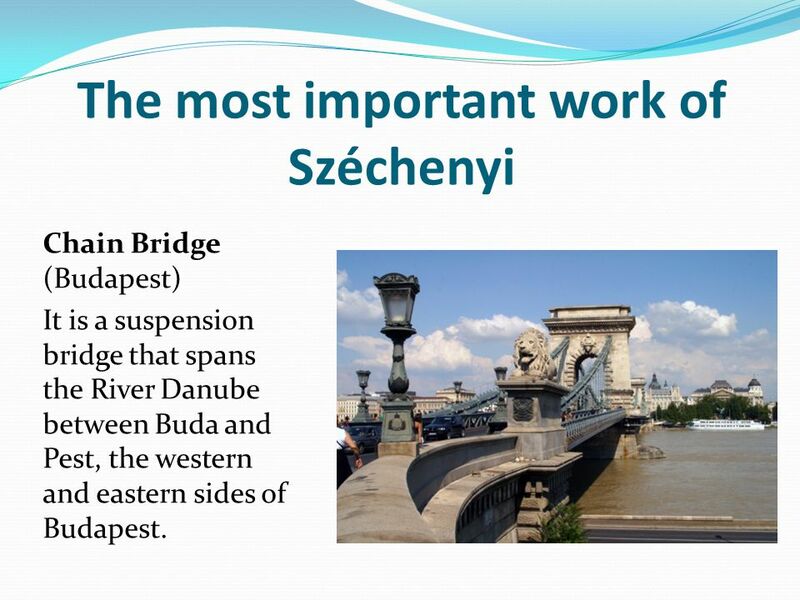 8 The most important work of Széchenyi Chain Bridge (Budapest) It is a suspension bridge that spans the River Danube between Buda and Pest, the western and eastern sides of Budapest. 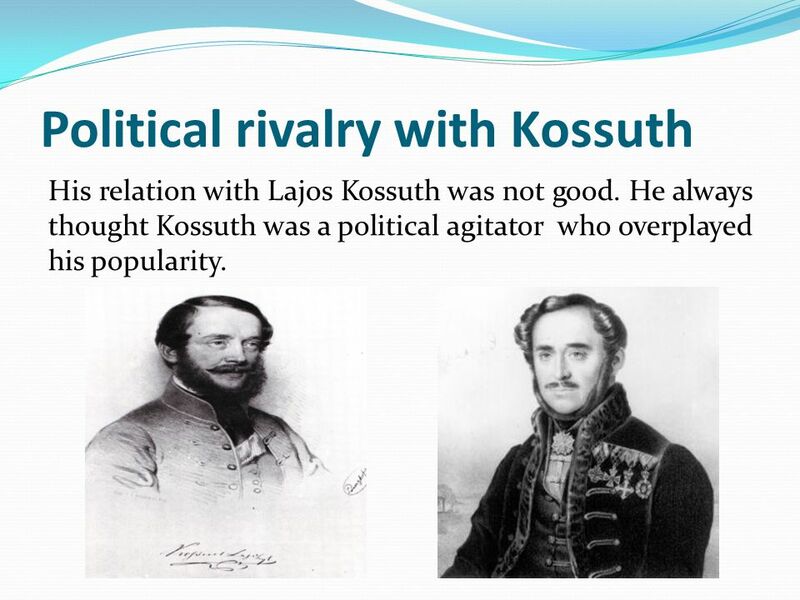 9 Political rivalry with Kossuth His relation with Lajos Kossuth was not good. He always thought Kossuth was a political agitator who overplayed his popularity. 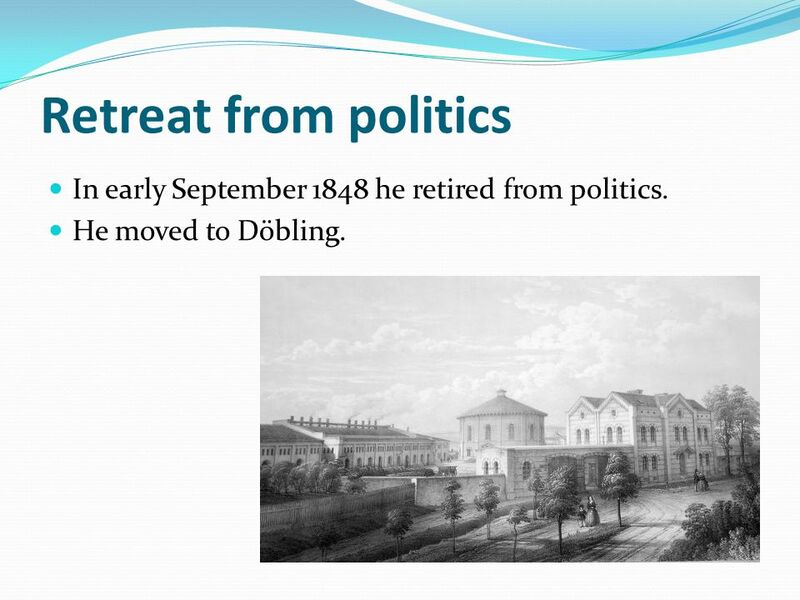 10 Retreat from politics In early September 1848 he retired from politics. He moved to Döbling. 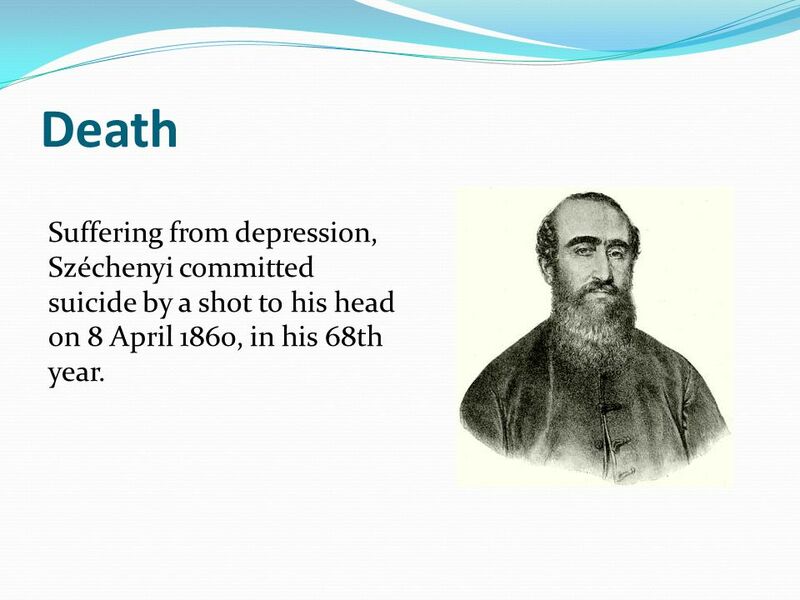 11 Death Suffering from depression, Széchenyi committed suicide by a shot to his head on 8 April 1860, in his 68th year. 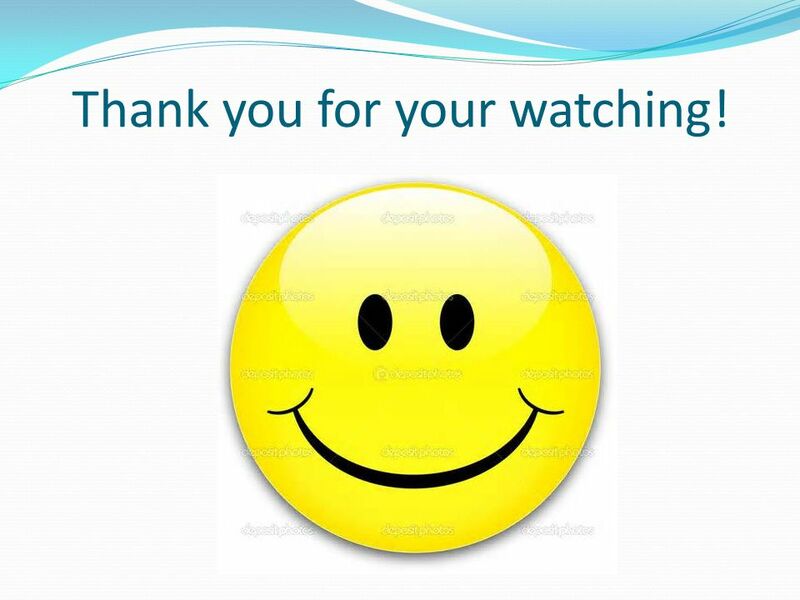 12 Thank you for your watching! 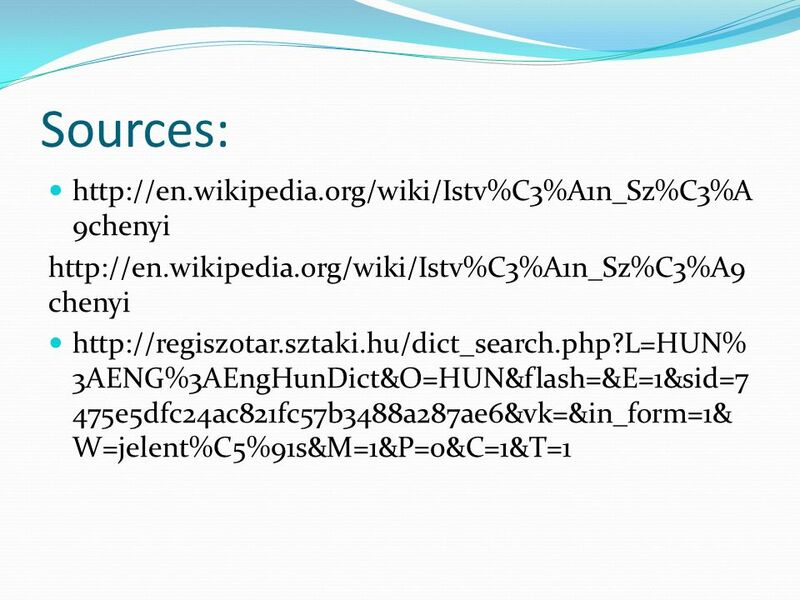 Download ppt "Made by Dávid Takács. István Széchenyi Count István Széchenyi de Sárvár-Felsővidék (21 September 1791 – 8 April 1860) was a Hungarian politician, writer,"
Made of : Viktória Takács Péter Gombor  Marcell Breuer  Imre Makovecz  Miklós Ybl  Mihály Pollack  Ödön Lechner. WHO AM I? I WAS THE CULTURAL MOVEMENT THAT BEGAN IN ITALY DURING THE 1300’S. I SPREAD TO ENGLAND, FRANCE, GERMANY, THE NETHERLANDS, SPAIN, AND OTHER COUNTRIES. Tyler Jordan Finn Sarah. Born around 460 B.C.E in Abdera, Thrace Traveled to Asia using the inheritance his father gave him. Visited Egypt, Diodorus and. Made by Bernadett Szikszai and Lili Bartus. 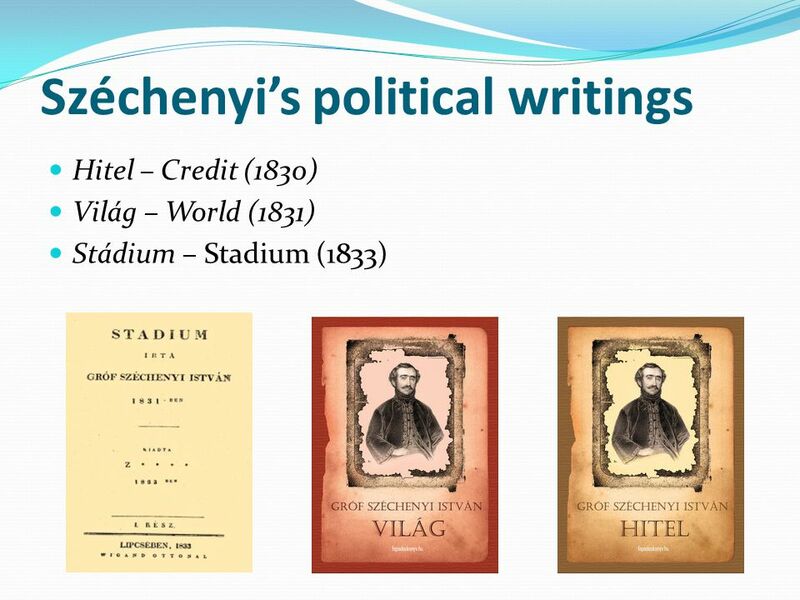 His life István Széchenyi was born in Vienna, on 21 September He was a Hungarian politician, theorist. Budapest Mens sana in corpore sano project. Where is it? Understanding Europe- A Cultural Mosaic By Lila Doma and Liz Grau Indiana University West European Studies Office. The Elizabethan Age and Shakespeare Gifted English I.
Salvador Dalí Salvador Dalí was a Spanish artist and one of the most important painters of the 20th century. He was born on May 11, 1904 in the town.  He was born 15th of September 1984  The member of the British royal family  The son of the prince of Wales Charles and princess Diana, grandson of. Shakespeare His Life and Works Early Years Born on April 23 rd, 1564 in Stratford-upon-Avon Father, named John was a glove maker and a politician. Ferenc Liszt József Gregor Általános Iskola A Quest for Heroes 2013 - 15.